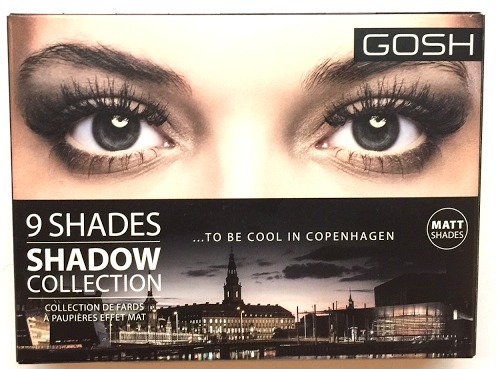 I wanted to bring you this shadow palette from Gosh Copenhagen, again it is from the upcoming SS16 range that will launch in February at Superdrug. I actually really like this palette the size is perfect, I am not a lover of huge palettes as I find them a little difficult to handle, with its sleek back matt case and large inner mirror this one is just perfect. Although not available until February this really is one to put on your must have list, especially if you are the queen of the smoky eye, it is something I am working on, I tend to be more queen of the just been punched in the eye look ! This little palette is perfect though for mature eyes like mine, being all matt shades they don't highlight the wrinkle gremlins in the way that shimmers sometimes do. Nine shades ranging from cool to warm, starting with Ivory and going through greys, taupe, browns and ending in a charcoal black, superb pigments, I tried these on a night out in London last night, which for a normal person is a couple of hours, I had to do my face in the afternoon to travel up and it lasted all they way into the evening, and on returning home at gone midnight, Cinderella style, There was not a crease in sight !! ( I did use a primer ) which may have helped but even so, I was pretty impressed by it's staying power. This is one to watch for sure. If you can't wait until February, the other palette colourways are definitely worth looking at.